LuxeGetaways Magazine – Fall/Winter 2017 | Committed to long-term success, Jordan says that if they aren’t getting better, they are getting worse. Fortunately, in this case, the entire brand continues to only get better each season. John Jordan has always said, “We focus on three things at Jordan: food, wine and hospitality.” Everything you taste, see, learn and feel at Jordan Vineyard & Winery contributes to the evidence that these three tenets constantly guide the experience for those fortunate enough to visit. From the excellent wines; to the wine tours with beautiful food pairing bites sampled at stunning locations on the property; and further to the friendly staff – the hospitality here is palpable. So good in fact that Jordan has just been named one of the ”3 Best Vineyard Experiences 2017” by American Airlines’ inflight magazine Celebrated Living. LuxeGetaways caught up with John recently at his Alexander Valley Winery Estate in Sonoma County, California, to learn about Jordan Vineyard & Winery’s unique approach to hospitality. With a strong food program, ten years of enhancements to improve the vineyards and cellars, they now turn to hospitality to create new experiences for their guests. LuxeGetaways: Hello John. Your parents began this journey with the winery more than 40 years ago because they loved French food and French wines. We have heard that the adventure began with a wish to create a First Growth style Bordeaux Cabernet Sauvignon. Would you briefly share with us what your parents had to consider in order to build a winery, and an excellent wine brand? John Jordan: There were three primary considerations; location; design of the winery and the hiring of the winemaker. For the latter, my parents engaged the legendary André Tchelistcheff. LG: In a time when corporate entities are buying up many of the family wineries here (and all over the world), you own Jordan Vineyard & Winery, and take an active role here. Tell us about the new programs you have brought on board, and how you will guide Jordan Estate into the future? Jordan: My mission has always been to ensure Jordan’s commitment to quality. This is especially important in an era when wineries increasingly exist within large corporations. Many of these larger corporations (within the beverage industry) have very short time horizons, and do not focus on the long term, or on quality in the same way as an independent winery. We are always seeking to improve our fruit sourcing for one; and have made the switch to 100% new French oak for our cooperage. Our philosophy is ‘If we aren’t getting better, we are getting worse’. That philosophy paired with our willingness to invest in quality over the long term separates Jordan from corporate wineries. LG: How do you stay true to the three pillars of Jordan’s identity? Jordan: Easy. I enjoy all three on the weekends. LG: Jordan has one of the best food and wine pairing tours, the Estate Tour & Tasting, which is open to the public. The tour capitalizes on your stunning property with your French chateau, rows of grape vines, chef’s garden, tasting in the olive grove by the lake, and ending at the exquisite Vista Point. Would you share a bit about the diversity of your working farm on the Estate? Jordan: Jordan is more than just a winery. It is an homage to certain old world traditions. As such, having a chef’s garden is not only a lot of fun; it is also an opportunity to provide a broader context for our wines – not just in place, but in time, and it brings delight to our visitors. LG: What would surprise visitors to the Jordan Estate? Jordan: The number of animals we raise and care for here. We have cattle, bees and miniature donkeys – and my three rescue dogs. LG: John, you have also introduced an exclusive Champagne, Jordan Cuvee Champagne by AR Lenoble, and caviar from Tsar Nicoulai Caviar, the Jordan Chef’s Reserve, at Jordan. Would you tell us how that came together? Jordan: Is it possible to celebrate anything without Champagne? I thought not. We wanted to be in a partnership with a similarly independent and quality oriented brand in France. At Jordan we are about authenticity. Enough of this ‘Sparkling Wine’ stuff. We wanted the genuine article, and that means the Champagne region in France. LG: We absolutely agree. And the more we find out about you, the more intriguing you are to us. John please tell us, as a child, what did you want to be when you grew up ? LG: John, you are one of the youngest pilots to have so many hours in the air. You also served in the Navy, and you are a flight instructor who owns and flies your two jets: a Cessna Citation M2 and a Gulfstream III. Are there parallels between flying and running a hospitality focused winery? Jordan: There are absolutely no parallels between running a winery and flying. The wine and hospitality businesses are subjective. Flying is the most unforgiving and objective activity there is. There are no gray areas. LG: We also found out that you created a Tablet Wine List called Tastevin, which is used by restaurants. An iPad is handed to guests at the table. Tastevin offers custom pairing for the restaurant guest, back of house real-time sales, inventory management and analytic reports among many other features. It is the most complete system we have seen. What was your inspiration, and can you tell us more about it? Jordan: I was at a restaurant where something gross was spilled on a wine list and the pages were stuck together. Additionally, the list had not been updated and the first three wines I requested were out of stock. I thought to myself, ‘there has to be a better way to do this… it is the 21st century for God’s sake. LG: You are also a humanitarian. Will you tell us about The John Jordan Foundation? Jordan: I created a foundation to bridge funding gaps in the public sector. I want to support programs that improve quality of life for our most vulnerable fellow citizens, placing special emphasis on those who provide the disadvantaged with the tools to succeed educationally and professionally. LG: We’ve enjoyed speaking with you. Thank you John, and we wish you and Jordan Vineyard & Winery continued success. We cannot wait to see what you will do next. 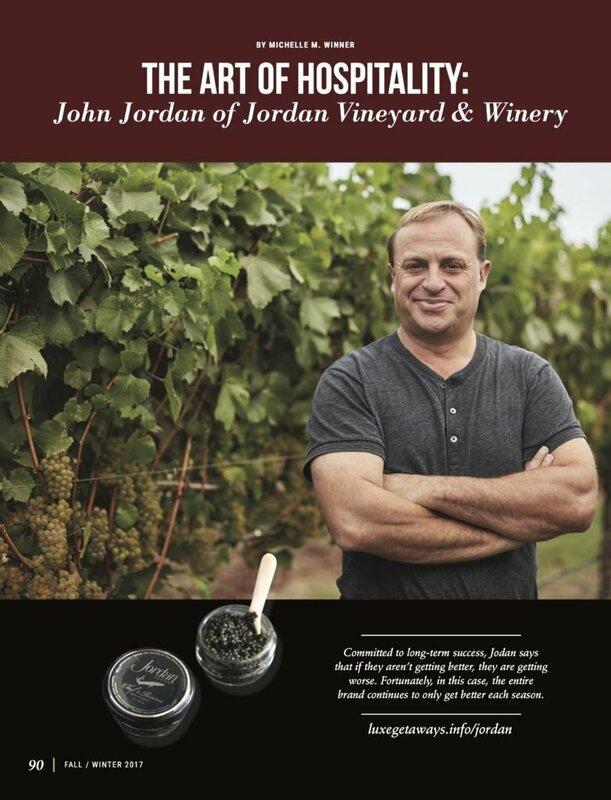 The best way to find out more about Jordan Vineyard & Winery, their unique hospitality, beautiful wines, tasting experiences, Jordan Rewards, and their exceptional property tours is to sign up for their newsletter.